The most popular marquee we recomend when planning parties is a clearpsan frame marquee.These marquees are known as clear span structures because they have no central poles, like traditional marquee with guy ropes, which makes for an unobstructed view and clear open space inside. This makes them perfect for weddings, birthday parties and corporate events alike. We even use these marquees as an affordable solution to cover festival stages with an open gable end. They can be installed on almost any surface from gravel, to grass and even tennis courts as they can be secured with weights instead of stakes (however we use pegs/stakes where possible which are advised in unsheltered areas and severe winds). This type of marquee is modular and can be erected in widths from 3 meters (10ft) to 21 meters (70ft) wide and almost as long as you need in increments of 3m. Clear span tents are so flexible we can make L-shaped marquees, U-shaped marquees and join them together with a new cruciform design to make an open plan T-shape marquee which means you don't have any gable ends obstructing your interior view. We can also provide hard flooring for all surfaces as well as carpet of almost any colour, coconut matting, walkways, clear window walls and clear PVC roofs so you can view the night sky. 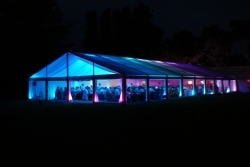 If you need to hire a marquee in Oxford or cover for your event in Oxfordshire or neaby counties, we have the right one for the job.